Holiday shopping time is upon us. Which brings up the question of what presents to buy folks. Or what, if anything, to ask for. I was talking to a friend the other day about updating our Amazon wish lists and we were both having trouble coming up with present suggestions. One option is to look at the automated "people like you like" suggestions on Amazon. But do you really ever use those? They often make me scratch my head and wonder why some algorithm thinks I would like band x or movie y. I'm way more likely to find stuff I like through various online boards, blogs, and forums where actually, real, like minded humans are talking about what they are into. "Microsoft has recently started hiring experts to help round out the Zune Marketplace’s low-traffic departments, like folk music. It would’ve been more cost-effective for the company to take a hint from Oink—if it could connect a bunch of brilliant music freaks with an appreciative audience for their comprehensive knowledge of vintage Turkish psychedelia or obscure Japanese noise or insane Bollywood soundtracks, the Zune Marketplace might start looking more like Amoeba Music and less like Borders." Right on! That lesson can be applied across online retailers, and really to any 2.0 type service. Its all about community. And speaking of Amoeba Music and Zune, when I was in San Francisco I picked up the latest album by the Oakland band Rogue Wave at the Haight Street Amoeba. And then discovered that one of the songs, called "Lake Michigan" for some reason, is in a Zune ad. The Zune ad that doesn't feature the female singer who sounds like Cat Power but isn't. The album is relatively hit and miss, like their past two releases, but is worth checking out for some fairly solid, interesting indie pop stuff. And not one, but two, songs that reference Chicago. In fact, I listened to Rogue Wave on the bus from Lincoln Square back to the 40 last Sunday. And then proceeded to enjoy a yummy Gouden Carolus D'Or - Cuvée Van De Keizer* at the Hopleaf while reading about Oink in the Reader. The D'Or is a very nice, sipable wintery beer with mild spice and fruit undertones. Only about half the people I've recommended it to like it, kind of like Houblon Chouffe, but those that do love it. So give it a try. *Beer Advocate requires registration to search beers but it's free, so go ahead and register now. We'll wait. Take a look at this very nice, lengthy article on coursecasting from the LA Times that was reprinted on the Tribune website this morning. And I'm guessing in print as well, for some reason the Trib doesn't have a weekend only print subscription option. Not very customer friendly! "Something revolutionary is happening," said UC Berkeley professor Richard Muller, whose Physics for Future Presidents class airs on iTunes. "A large number of people around the world want more education. They thirst for understanding and knowledge." The article mainly focuses on iTunes U but does give a good overview of the impact of freely available lectures to those outside academia. For your Thanksgiving reading pleasure, here is an article from today's Sun-Times website about a gentleman who has worked and lived at the Irving Park YMCA for 58 years. He sounds like a nice man. He does seem to really dislike one particular song though, for good reason. "Whenever I hear it at the Cubs ballpark, I get so aggravated." In blog news, I'm going to try an experiment where once a week I post something that covers one topic in the library/publishing/social computing world, one food/ drink topic, and one music topic. Look for the first in what will most likely be a one part series tomorrow. Happy Thanksgiving. Or Thursday to my Canadian friends. Ok, I confess. In the most clever ruse in the history of Internet ruses, I, David Free, am the Annoyed Librarian. 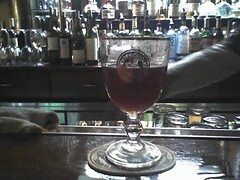 I know I work for ALA (kinda), am male (definitely), and more likely to drink Belgian beer than martinis. But, gentle reader, that was just to throw you off. Have you ever seen AL and I in the same room together? Of course you have. Because she is me. It's been a good run of riling people up, but there is too much pressure. Too many people on my tail. So I confess. I will continue to post my annoyance at all things library, but now you know. I am also Lonelygirl15 and that Britney Spears guy. And Bigfoot. And really, isn't there a bit of the Annoyed Librarian in all of us? ?